On Saturday, June 3, to honor the one-year anniversary of the oil train derailment, spill, and fire in Mosier, Oregon, Northwest community members are gathering together in support of Mosier area and tribal communities and cities like Spokane, Vancouver, and Portland, who are threatened by, but standing up to, oil trains [1-5]. At a public event in Mosier, hosted by Stand Up to Oil, Friends of the Columbia Gorge, Columbia Riverkeeper, Washington Environmental Council, and Climate Solutions, participants will demand a thorough, Union Pacific cleanup of Mosier and an end to reckless oil trains, reminding Washington Governor Jay Inslee and other decision makers to heed the warnings of this catastrophe. From 12 noon to 3 pm at the Mosier Community School, 1204 Historic Columbia River Highway (U.S. 30 East), regional activists will rally against oil-by-rail and hear from speakers including Yakama Nation Tribal Council chair JoDe Goudy, Mosier City Council members, Mosier physician Dr. Maria McCormick, Hood River mayor Paul Blackburn, Vancouver City Council member Alisha Topper, and several other tribal and faith leaders, elected officials, health professionals, and group representatives. Friends of the Columbia Gorge conservation organizer Ryan Rittenhouse will emcee the gathering followed by a short walk to the Columbia River, for more commemorations. Afterwards, Friends’ land trust manager Kate McBride will lead an optional hike to the nearby Mosier Plateau. Columbia Riverkeeper will live-stream the event through its facebook page, and @standuptooil will live-tweet #mosier. Bring friends and family, lunch and snacks, hats and sturdy shoes, and colorful banners and signs, and email Ryan@GorgeFriends.org with any questions or concerns. 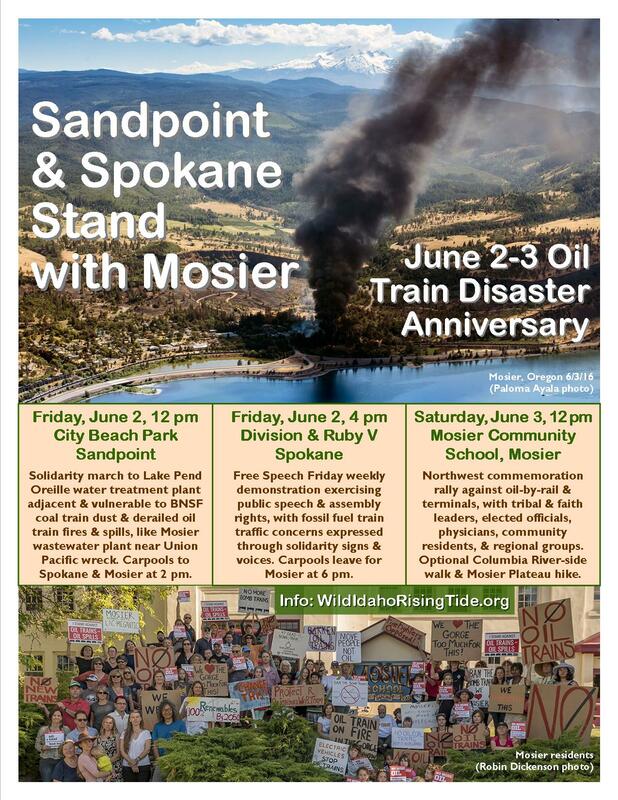 Please join Wild Idaho Rising Tide (WIRT) and Occupy activists and allies for carpools to Mosier, Oregon, and solidarity actions in Sandpoint, Idaho, and Spokane, Washington, to represent interior Northwest, rail-line communities solemnly remembering the June 3, 2016, oil train derailment, resulting devastation, and ongoing water contamination in Mosier. Opposing Burlington Northern Santa Fe Railway’s (BNSF) proposed, second rail bridge over Lake Pend Oreille and double downtown tracks, Sandpoint area activists are converging at 12 noon on Friday, June 2, at City Beach Park. Before Sandpoint carpools to Spokane and Mosier depart at 2 pm that afternoon, and return on Saturday evening, June 3, participants are marching north with Mosier solidarity signs on Sandpoint Avenue, to the Lake Pend Oreille surface water treatment plant. Completed in 2012 and operated by the City of Sandpoint, the facility treats and distributes 10 million gallons per day to two on-site, two-million-gallon reservoirs and over 4000 connections in Dover, Kootenai, Ponderay, Sandpoint, and surrounding Bonner County . Only 65 feet from the BNSF tracks carrying full, explosive, Bakken shale and Alberta tar sands crude oil trains and dusty, Powder River Basin coal cars toward and over the lake rail bridge, this critical, community source of treated lake water is just as vulnerable to an oil train fire and spill as the Mosier wastewater treatment plant adjacent to the Union Pacific train derailment that inundated the facility with 13,000 gallons of the estimated 47,000 gallons of oil released from four derailed tanker cars in early June 2016 . Occupy activists are meeting between 4 and 6 pm on Friday, June 2, for the weekly, public demonstrations of Free Speech Friday at the V, where Ruby and Division streets split north of the Spokane River bridge and North River Drive in downtown Spokane. Organizers invite everyone to bring smiles and Mosier train wreck anniversary signs and banners, and address concerns about coal and oil train traffic through Spokane, while exercising rights to freedom of speech and assembly in public places. Music, singing, and dancing may also emerge, before regional activists depart for Mosier at 6 pm. WIRT activists are deeply grateful for continued, inland Northwest community input, determination, and work on oil and coal transportation and terminal issues, among growing networks and coalitions of regional groups. For further information and to RSVP and participate in solidarity actions and carpools, contact WIRT by phone or text, email, or facebook messages. Please broadly share this event announcement and print and post the Sandpoint & Spokane Stand with Mosier Flyer. If you can contribute toward the 700-mile round-trip, $150 travel expenses of frugal, volunteer, Occupy and WIRT activists committed to including Idaho and Spokane in the Mosier gathering, please assist through the WIRT website donation button, the enclosed addresses, or in person. On June 3, 2016, the tiny, Columbia River Gorge town of Mosier, near Hood River, Oregon, made regional and national news, as firefighters battled for 14 hours to contain a dangerous fire from a derailed, 96-car, Union Pacific train carrying highly flammable, Bakken crude oil [1-5]. Students at the Mosier Community School and some residents were evacuated, oil spread in a sheen on the Columbia River, and the community of Mosier lost sewer and water service for days, due to contamination risks. After the fire, tribal leaders, elected officials, and local residents gathered at the site to call for an end to oil train traffic through the Gorge. One year later, contamination persists in Mosier’s groundwater, while oil, coal, and railroad companies still seek to expand the number of fossil fuel trains through the Columbia River Gorge National Scenic Area, over a proposed, second, BNSF rail bridge on Lake Pend Oreille, via elevated tracks in downtown Spokane, and across the Northwest, despite opposition from tribes, the town of Mosier, and many large cities along the rail route, like Portland and Vancouver, who passed local laws banning oil train terminals. During the next few months, in response to a recommendation by the Washington state agency, Energy Facility Site Evaluation Council (EFSEC), Governor Inslee will make a final decision about whether to deny the Tesoro Savage oil train terminal in Vancouver, a project that would bring up to five additional, loaded oil trains each day through Montana, Idaho, Washington, and the Columbia River Gorge. The experiences of Mosier and its regional community, enduring the June 2016 oil train disaster, should be all the evidence the governor needs to reject the oil terminal.